Howler amps up the crowd. A natural team player, Howler the Huskie brings joy to everyone he meets. "I like to encourage others, whether it's welcoming new students during Orientation, dancing on the sidelines at football games, or cheering courtside for our national champion women's basketball team," said the mascot for the University of Saskatchewan's Huskie Athletics. For four days next week, Howler will bring his enthusiasm and zest for life to a new location—at the Spring Convocation ceremonies at TCU Place in downtown Saskatoon. While it is a bit more formal than his usual appearances, he sees no reason not to celebrate the occasion. "People commit a significant part of their life to their education," he said. "Now they're done—what an accomplishment! This is my first time at convocation and I'm honoured to be a part of it." Howler has humble beginnings, growing up on a farm just outside of Nipawin, Sask. alongside many brothers and sisters. As a young pup, he loved the wide open space and helping his humans on the farm. However, he always knew he was destined for the city—and for the U of S.
"I come from a long line of hard-working mascot dogs," he exclaimed proudly. Besides being a tireless sled dog, his grandpa Duke is emblazoned as a bronze statue outside of Griffiths Stadium in PotashCorp Park. His father, Hymie, spent some time at early Huskies hockey games, while his uncle can be seen as the skating dog on the men's hockey jerseys. Howler hopes to keep his family pride alive while bringing Huskie Athletics fans to their feet. 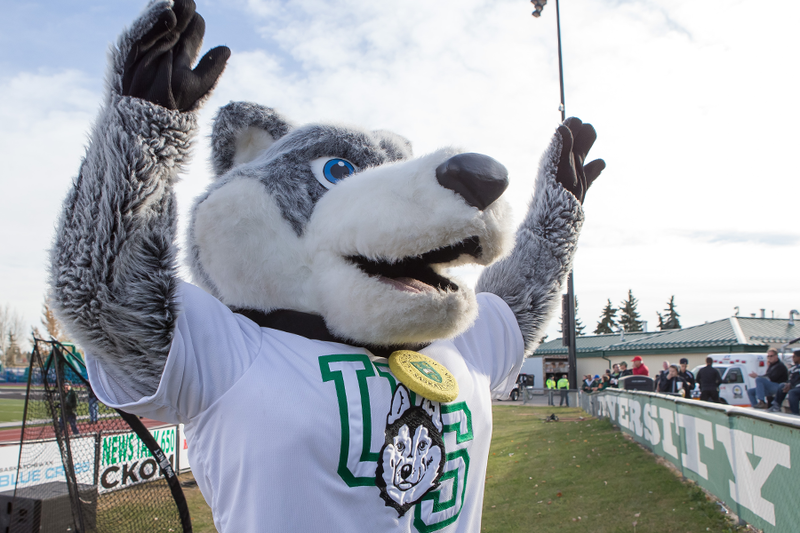 "I'm a big sports fan and am full of spirit for the U of S Huskies. Oh, and I can walk quite easily on my hind legs, which is a great skill to have."